I used to use their Vicco Turmeric Cream some 16 years ago, but never tried their toothpaste. Recently when I saw it at a local grocery store, I checked the ingredients list and immediately bought it. The price is quite decent for the quantity they are providing, when other toothpaste brands sell 80-90 gms for INR 100+. This is NOT a cosmetic toothpaste. Due to proven medicinal properties of its active ingredients, the Government has permitted manufacturing of Vicco products under Ayurvedic Drug License. See more details here. Vicco Vajradanti has been certified by 'Beauty without Cruelty India' and has also been awarded by PETA for creating a truly vegan product. Availability: Easily available in India in local pharmacies and grocery stores. Saw it on a few rare India online stores. Vicco Vajradanti is also available online for purchase in other countries but the price in $ is quite different. 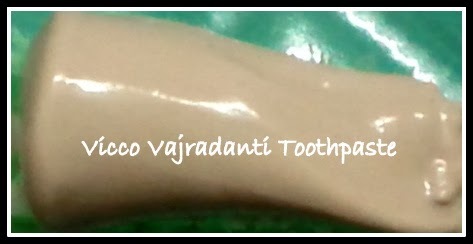 Vicco Vajradanti Ayurvedic paste is used in hardening of gums and teeth, cleansing and healing of wounds, tooth caries and inflammation of gums. It is also used on tooth ache and in the treatment of disorders of gums & teeth like tooth decay, pyorrhoea, swollen gums, bleeding gums and other periodontal disorders. After brushing, gently massage the gums and teeth with Vicco Vajradanti Powder for better results. "Vicco Vajradanti Ayurvedic Toothpaste is the original Ayurvedic toothpaste from India. Vicco cares for your mouth - effective, active, totally natural. Vicco cleans your teeth, refreshes your breath, and stimulates your gums. Purified Chalk, Water, Sorbitol, Sodium Lauryl Sulphate, Gum Tragacanth. Extracts of Indian Licorice root (Jeshthamadh / Yasthimadhu/ Mulethi / Glycyrrhiza glabra, Linn. - Root Powder) 1.3 g, Indian Almond, Common Jujube, Currant, Sarsaparilla, Cinnamon, Sappan Wood, Persian Walnut, Rose Apple, Medlar, Barleria Prinoitis, Prickly Ash, Asian Holly Oak, Bedda Nut, Bengal Madder, Bishop's Weed, Catechu, Mayweed and Geranium. Menthol, Thymol, Oils of Clove, Eucalyptus and Peppermint. For further detail on the role of each ingredient, you can check this link. Vicco is not tested on animals. Contains no animal ingredients." Well at least I find it very very impressive. I remember when Dabur had released it's Meswak toothpaste, there was a very misleading ad aired on the TV talking about countless benefits of the herb 'Meswak'. Later the ad was pulled off, I don't know why. When I bought Meswak, I was super shocked to see Dabur has added formaldehyde (a carcinogen) in Meswak toothpaste. I never looked back at it again. At least Vicco is being transparent about the ingredients and not making any stupid claims like Dabur. In fact, Vicco still airs its decades old TV ad. It needs no advertisement, at least in India, it is so well known and trusted. I wanted to try a smaller packing of this toothpaste first, but the local grocery store had only this huge family pack of 200 gms. Now let me share with you that I am not blessed with pearly white teeth, which many of you may have. In fact, my teeth sometimes looked so discolored and stained, they could be called yellow. I thought it was staining due to tea consumption. But my dentist said 85% of women's teeth turn yellow after delivery and that my condition is totally normal. The medicated toothpaste and mouthwash given by the dentist caused me acute pain and sensitivity. I have never bought any specific teeth whitening toothpastes for fear of harsh chemicals in them. But none of the other bestest of toothpastes I had used ever made my teeth look prettier. However, Vicco Vajradanti took me quite by surprise. For the first time ever in my life, I can call my teeth pearly beautiful. They are not snow white but there is an immense transformation within a few uses of Vicco Vajradanti Ayurvedic toothpaste. So a big THUMBS UP! This toothpaste lathers sufficiently without creating any bubbly crazy foam like chemical based toothpastes. It is beige / skin in color. Not at all harsh on the teeth. Leaves my mouth VERY fresh. Leaves my gums feeling very refreshed and healthy. I haven't noticed any plaque or residue depositing on my teeth ever since I have started using Vicco Vajradanti. Normally, the upper set of teeth slightly overlap the lower set of teeth. But unlike most of you, nature has placed my upper jaw right above the lower jaw, which is slowly eroding the enamel of my lower teeth. My lower front teeth are chipped at the top and there is sometimes a lot of sensitivity. I have been given night guards to wear on my teeth. I was not expecting this toothpaste to help with it. But I am surprised that I don't have any sensitivity issues while using this toothpaste. I have to floss very less now. And after brushing, I am left with an amazing taste in my mouth, like I have chewed rose petals. The taste is a bit strong for kids (no it does NOT burn on the skin), so I use a very very small amount, almost a little dot for my kid. Totally in love with Vicco Vajradanti and it is every bit worth buying. Thanks Rashmi. It is a great product. I hope you like it too. Ahhh that sounds painful Supriya. This toothpaste does claim to help with bleeding gums so go for it. At least you won't regret trying it, that I am sure of. But please do see a doctor too to check if the gums are bleeding due to any Vitamin deficiency or hormonal changes. I will definitely try it out . I too don't have pearly white teeth and have gum bleeding problem. I hope this toothpaste helps me overcome these problems. You are welcome and thanks for reading. This toothpaste definitely restores teeth's natural shine and stops any plaque from building up on the teeth, that's my personal experience. And yes, it does claim to help cure bleeding gums. If you try it, please do get back to this page and share if it helped with your gum bleeding. Also, please do see a doctor to figure out the actual cause of your problem, whether it is Vitamin deficiency, hormonal changes or if your current oral care routine needs more attention. Dear Rupa, thanks a lot for your feedback on this toothpaste. Great to know it works for you too :) Yes, while clicking pictures I noticed it has been manufactured in Nagpur and I did think of you at that time :) Hope you are feeling better and recovered by now. Gagan, What a co-incidence! I saw this toothpaste a month back in local pharmacy and wanted to try it. in my childhood I had used Vicco tooth powder.About tooth powder I can say it's awesome. I really like it. But if you are more into sweet foamy toothpastes then you may not like that! Also the tooth powder might stain the sink if you dont clean it properly but it gives very fresh feelings. Coming back to tooth paste, I am using it on and off and now that I have your review I will use it regularly and check for myself! Hey Shree, thanks so much for sharing about the tooth powder from this range. I was thinking of trying that for gum massage and then you mentioned about it in this comment :) I was under the impression that it may be a white powder but from your description, I think I have also seen it in childhood at our family friends' house. No dear, I am not into sweet foamy toothpastes, somehow they leave me with an sick uncomfortable feeling in the stomach, as if I am super hungry. I will now definitely try the powder on your recommendation. The only thing I expect from it is to be fine and not gritty. I still love this toothpaste and want to try their SF (Sugar free) version now. Didn't know earlier they have an SF one too. And do share your observation on the toothpaste whenever you use it regularly. Thanks Jalpa. Hope you like it and would love to have your feedback on it. I just answered your other comment under the 'Hair Care' section. Sorry I had missed out answering it earlier. I am still on Organic Surge color protect shampoo and haven't found any other good one yet. You can try their new one "Moisture Boost" shampoo which is now actually modified to a color protect one. It contains Ammonium Lauryl Sulfate, which is supposed to be mild but as they don't have any smaller packing, I am afraid to buy it in case it doesn't suit me. I had written to a supplier for base material so I can make/formulate my own shampoo and tell others too but the person was quite greedy and not at all helpful. It is on my 'hot list' and am continuously checking all available shampoos every few days. As soon as I find a good one, I will let you know. For the time being, you can try the Henna shampoo from Biotique. Wow, Vicco in fact is quite famous so am not surprised :) I had seen Dabur red paste too a few weeks ago and it sounds good. But somehow I am a little afraid to use Dabur now that I found formaldehyde in their Meswak toothpaste. 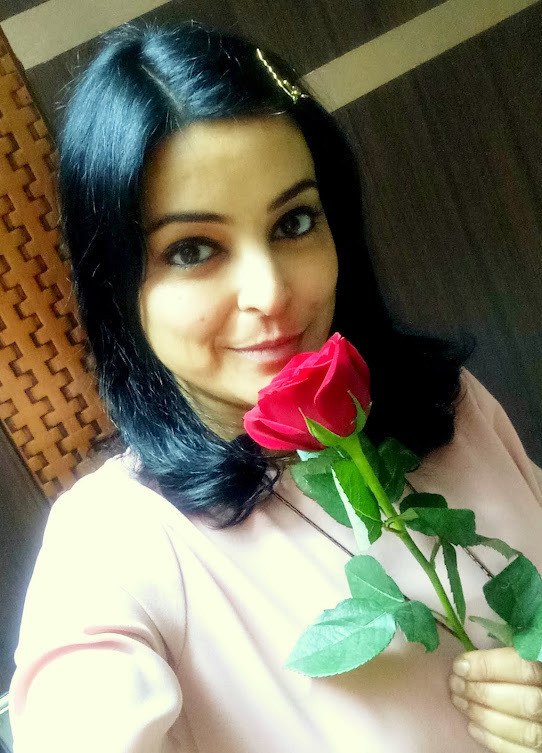 Ms. Gaganpreet, I have been following your blog for over an year now. One of the finest critics in India. I appreciate the passion with which you do any product review. 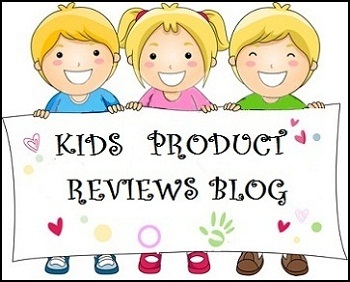 Hi there, this review is about Vicco TOOTHPASTE and you have mentioned Vicco TOOTHPOWDER. I have never used any toothpowders, so I cannot share any personal experience on that. But I received a comment on this article which mentioned about the usage of nicotine and tobacco in herbal toothpastes and toothpowders. On checking further and based on all the articles I read, I think Vicco toothpowder does contain Tobacco, which the sensitive skin of your mouth could not tolerate. I hope you stopped using it already. When you chew peppermint or clove or eucalyptus leaves, you get burning sensation because these are very strong on taste buds and need some getting used to. The burning sensation you feel initially could be because of the presence of Eucalyptus, Peppermint and Clove oils in this toothpaste. Thank you so much for providing the best review on this product. It becomes very interesting to me and i will definitely try it. however now i am using products of Himalaya (Dental cream, shampoo and skin cream). actually as a student of pharmacognosy and phytochemistry i am writing a manuscript on Caesalpinia sappan locally called sappan or patang. i found from the literature that this plant is included in herbal drugs Lukol and Vicco vagradantii. so searching more information about the plant through net, bring me in to this page where i found your valuable review. yes i have read Vicco vagradanti ingredients list and i found several herbals are there present. among them i know about juglans regia, Quercus infectoria and Caesalpinia sappan which all have really potent phytochemicals including flavonoids and tannins which strengthen the gangiva or gums and stops stop bleeding of gums. moreover they are useful in curing inflammation also. obviously, all the other plants present in Vicco are also of important medicinal plants and in one word the product is composed of natural materials which are more friendly than synthetic. So, thanks again providing this much amount of information about the toothpaste. a good insight on the Vicco ingredients whose tv add no one can forget !! I think we should educate people on using more natural and ayurvedic products instead of fancy synthetic BS. Hope Vicco manufacturers do not stop such wonderful products and do not do anything that would make us lose our faith in them. Vicco - you need no fancy tv add. Keep going. The claim "sodium lauryl sulphate comes from Indian coconut oil" is a marketing gimmick. What they’re talking about here is where they’re getting the raw materials—in this case, the lauryl alcohol. SLS is synthesized in the lab by treating lauryl alcohol with sulfur trioxide gas or chlorosulfuric acid. Lauryl alcohol can come from petroleum, but it can also come from coconut oil. The oil is put through an elaborate process, however, that liberates the fatty acids, then hydrogenizes the oil, then pulls out the lauryl alcohol. No matter where the alcohol comes from, it’s still mixed with the other chemicals to produce SLS or SLES or other forms of the ingredient. The result is still a chemical that is a long way from the original coconut oil. We may feel better having something that originated from coconut oil rather than from petroleum, but that doesn’t mean the chemical will not be irritating to skin or hair, or that it will not be contaminated from manufacturing processes. Please update your review by including some of these details. Thanks for the info. I was already aware that SLS is chemical and therefore irritant. How can they claim that the toothpaste is all natural ingredients? I guess this is blatant mis-marketing by a very large corporation. Such a shame. Correct me if I am wrong but I thought the taste and consistency of vicco some 20 years ago was different/better; has it always contained SLS?? Correct. It really doesn't matter how SLS is synthesized or where it came from, but indeed if it is there in toothpaste then it is not safe for oral skin and gums. However, can't forget to mention that there are other benefits as claimed which is far better than other toothpastes containing SLS. However, I would always go for the SLS free one. Very disappointing, The company claims it is 100% natural ingredients and it's a consumer deception. looking for another natural Toothpaste..
No. There is no fluoride in Vicco products. I love Make in India Concept and hence I purchased a Vicco toothpaste this time. Trust me its waste product ever i seen, it never gives freshness and introduced me a bad breathe from the day one i started it. I never recommend this product to anyone. I use Vicco here in Canada! It costs more to get it here but I like it better than all the western toothpastes. My teeth look great and are smoother than ever. I recommend it to all my friends! I am 20 weeks pregnant now and my gums were so inflamed that it caused major bleeding and i was really scared as it is part of pregnancy that you are likely to experience this. I was going thru supermarket and caught my eye on this toothpaste as i have used Vicco Tumeric Cream.... which is amazing by the way. With no doubt I bought the toothpaste as I like to try different toothpaste everytime. But to my amaze, within few days, my gum started to heal, inflammation was gone, bleeding slowed down and have been using for quite 3 weeks now and OMG this is the best recommendation that I can give to pregnant women that is suffering from inflammation and bleeding problem. I don't think I will be using any other toothpaste from now on..... Thank you Vicco for making such a amazing toothpaste .... so I can enjoy my food without complaining and annoying my husband with my painful tooth story. Tried and tested. Stopped my sensitivity and helped kept my teeth as white as possible. I always recommend to my friends. Best thing. Can anybody tell me if the Vicco gum powder really helps with receding gums.. I don't think so a toothpaste can make your teeth strong, no matter which one you use. All those pastes recommended by people or companies are most of them by their personal choices. There's not much to do with dental care. If you take regular tooth paste and take care of your teeth regularly e.g. after every meal do proper rinse for 2 minutes minimum and avoid keeping sugary or similar sticky stuff off from teeth after every time you eat or drink. You can save your tooth for long time. I met personally few people they have very good diet throughout years and they are above 40. I bet, Their teeth are much better than anyone who is 25 with modern less nutritional diet. I was suffering from bleeding gums, gave a try to vicco toothpaste and very much relieved from not only bleeding gums & pain after brushing. I have been a little paranoid about an article that I read which says Vicco has nicotene with it. I am still doing my research for it. someone please educate me.